This packet sows up to 21 feet. 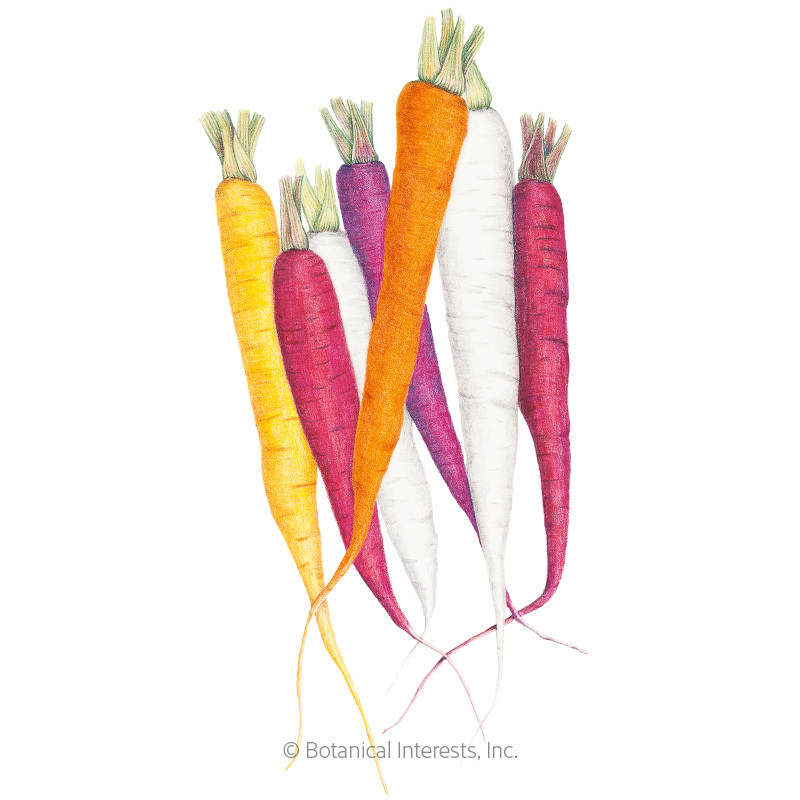 Grown and eaten in Asia and Europe 1,000 years ago, these colorful carrots are available once again. Just like the popular orange carrots, red, purple, white, and yellow carrots contain plenty of vitamin A and other healthful nutrients. Carnival Blend carrots can also be harvested when only 3"-4" long for gourmet baby carrots. Variety Information: PURPLE: Purple skin, orange interior, tapered roots. RED: Red skin, yellow interior, rounded ends. YELLOW: Yellow skin, yellow interior, tapered roots. WHITE: White skin, white interior, rounded ends. ORANGE: Orange skin, orange interior, tapered roots. I tried a few rows of this variety pack this year and will sow more next year! The color was beautiful in rice, salads, and stir fry dishes and of course, the taste was excellent as well. The white carrots got much larger than the other colors, but they held well in the ground when I was waiting to use them. These grew really well and were a huge hit with everyone. They taste great in addition to being fun. The packet I got had more white and orange than yellow, red and purple, but with some strategic harvesting, I was able to give away some very colorful bags of carrots as well as make some really pretty salads.